A Barrett Smythe and Company knife of immense artistry that Barrett Smythe had in their catalogue for $5500 before they closed their New York store. 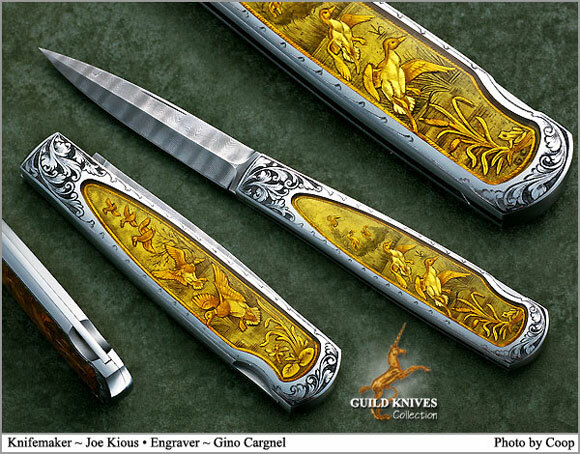 The Gold Bolino engravings of Mallards in flight are by the famous Italian gun and knife engraver, Giacomo Cadillini. The gold engraved birds and their backgrounds are set under clear Quartz Crystal interframes. The surround of the interframe inlays is entirely engraved in a classical Italian style. The dagger-shaped double grind blade is stainless damascus. An impressive gentlemanâ€™s dress knife.